The sound problem you have experienced is most likely caused by the QoS Packet Scheduler. It is enabled by default on Service Pack 2. QoS Packet Scheduler manages the network bandwidth by prioritising a data packet. This influences the way audio and video packets are sent. 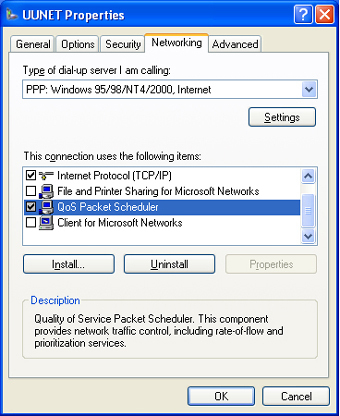 From the XP "Start menu" select "Connect To" and then "Show all connections". This will display a window showing all your network connections. (If your using the 'classic' set up, the steps are: "Start" select "Settings" then "Network Connections". Highlight the connection through which you connect to the Internet (If you are connected via a router or LAN, this will be the "Local Area Connection"). Right mouse click and select "Properties". This will display the "Properties" configuration for the connection. For a "Local Area Connection" make sure you are on the "General" page of the "Properties" configuration. For all other connections click on the "Networking" tab. 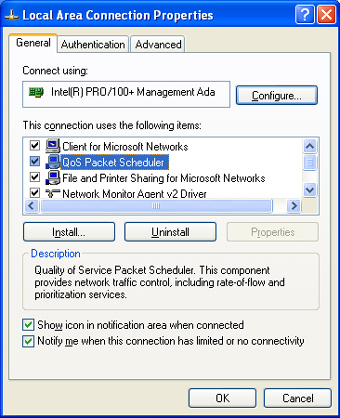 In the window titled "This connection uses the following items:" highlight the QoS Packet Scheduler, then disable this item by unchecking the tick box. If you are unable to uncheck the tick box (the QoS Packet Scheduler was greyed out before you highlighted it), click the uninstall button at the bottom of the window. Then click yes to confirm. If you are not asked to do so, we recommend you now restart your computer. Once you have restarted your computer, please try to make some phone calls.